In the beginning (if you call 1962 the beginning), there was Z Cars. 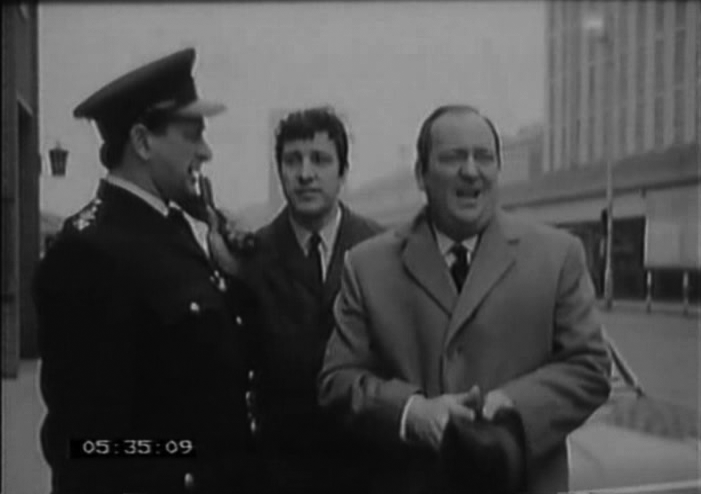 Z Cars was a series about the work of mobile uniformed police in the fictional town of Newtown. This series was very successful but came to the end of its original run in 1965. Two characters from the original series were considered so successful that they were moved over to another series that moved away from uniformed police but onto regional crime squads and plain-clothed CID (Criminal Investigation Department). These two gentlemen were Detective Chief Inspector Charles Barlow and Detective Inspector John Watt. They are the first regulars we ever see in Z Cars and that was the start of a very long working relationship. The series that spun off from Z Cars was Softly, Softly. The series name comes from the proverb “softly, softly, catchee monkey”. 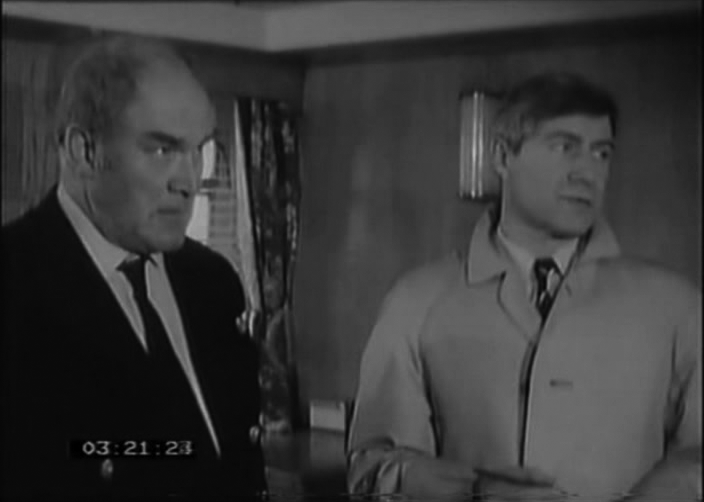 Like Z Cars which came back in 1967, Softly, Softly did not have a straightforward run and the duo of Barlow and Watt would be making appearances in other series beyond this one. This week, I look at the fifth episode of the fifth series. Although it was not the end of the series changes were coming up for the Softly, Softly. Sometimes it is not always clear to know what is happening in a series. I have a few episodes of this series in my collection but have not really watched much of it; it sometimes is hard to know who the regular characters are and who are lesser or guest characters and I have to admit I feel a little vague on this one. 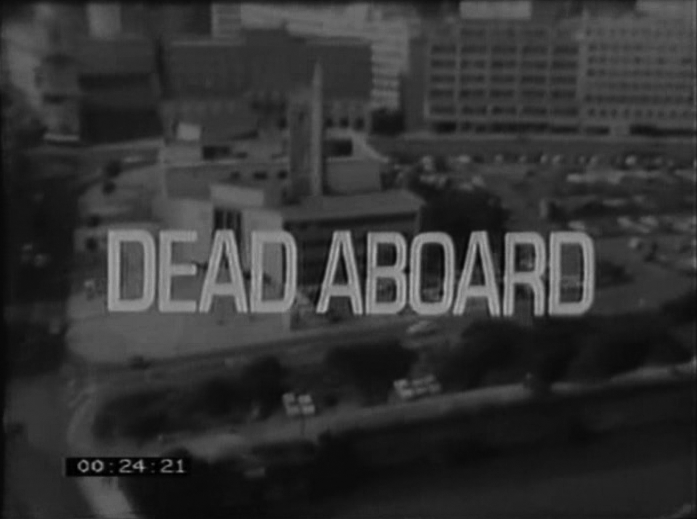 This episode revolves around a dead prostitute found in a shipping boat owned by two brothers. A young woman by the name of Carol seems to know more than she is telling officers. Eventually, Carol was able to help the CID figure out who murdered the woman. It was Bob Mason who was one of the owners of the boat the body was found on. In fact he was questioned when the body was originally found but played it straight about not knowing how it got there, even fainting when he heard there was a dead body aboard his ship. 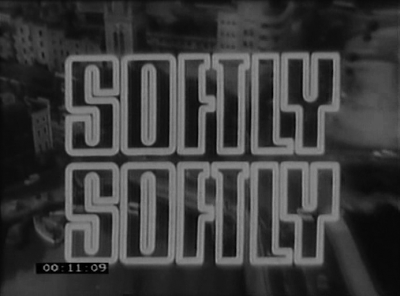 I was really interested in seeing this as Softly, Softly is a series I have seen mentioned in other articles about British television many times over the years. It is one of those BBC programs you hear so much about but really never get to see. In particular I wanted to see how Barlow acted in this episode. Like I mentioned earlier that Barlow (along with Watt) were part of Z Cars. Barlow could be really difficult and hard to work with on the force and I wanted to see how much we got of that in this episode. I was surprised to say that he wasn’t that difficult to anyone. It may have been down to the fact it was the birthday of another character Det. Sgt. Barbara Allin. The whole episode started out with Barlow, Watt, Cook, and Allin waiting for Detective Hawkins to show up for Barbara’s birthday lunch. It’s interesting that there is some kind of issue going on between Barlow and Watt. It is more interesting seeing they have such a long working relationship. Watt is not very responsive through most of the episode as if trying to stay away from Barlow. At one point in the episode, Watt points out to Allin that Barlow is up to something but he doesn’t know what it is. As I do not have any Softly, Softly episodes beyond this point I am in the dark as much as Watt. This episode has some familiar faces that people who are not obsessed with British television may recognize. This includes some of the main cast. Charles Barlow is played by Stratford Johns. Not only has he appeared in such programs as I, Claudius some people may know him best as Monarch in the Doctor Who story Four to Doomsday, Belkov in Blake’s 7, and Mr. Stockton in Neverwhere. 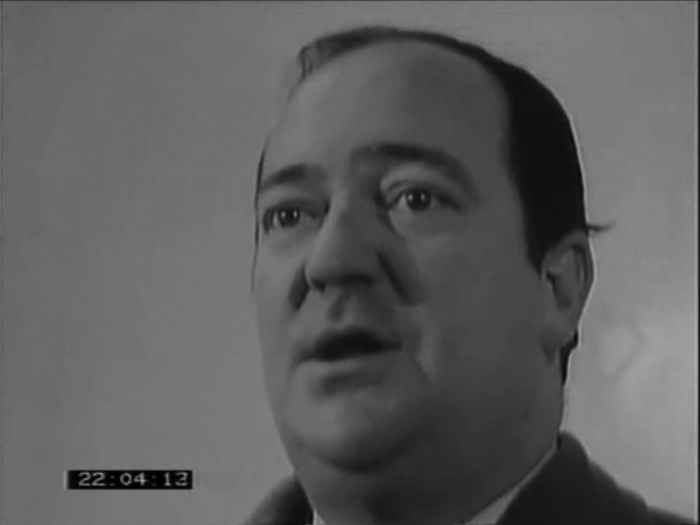 Watt is played by Frank Windsor who appeared in Doctor Who as Ranulf in The King’s Demons and as Inspector Mackenzie Ghost Light. He also appeared in other series such as The Avengers, The Goodies and I most recently wrote about him in my article for A for Andromeda. There are also some familiar faces in the guest cast such as Howard Lang who plays Captain Donaldson. 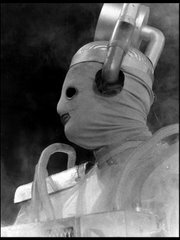 He was immediately recognizable from his appearance Horg in An Unearthly Child. The Screengrab on the left is from this Softly, Softly episode and from the right is from the Z Cars episode "Limping Rabbit". The timecodes are very different. Even though I mentioned that May is the month of final episodes to series, this episode from Softly, Softly is not that at all. It is the 5th episode of the fifth series. It is the last episode I have of this series in my collection. Though, technically even that is not true. 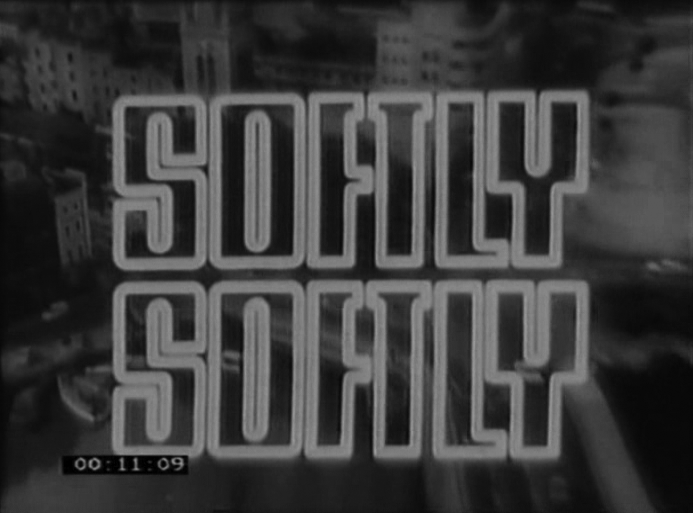 The eleventh episode of the fifth series saw the show renamed as Softly, Softly: Taskforce. The entire series consisting of Softly, Softly & Softly, Softly: Taskforce lasted for 12 series and ended in 1976. Stratford Johns left Softly, Softly but stayed with the character of Charles Barlow for Barlow at Large in 1971. The series lasted until 1975. Frank Windsor stayed with Softly, Softly: Taskforce until the series end. The iconic characters of Barlow & Watt reunited one last time in 1976 for the series Second Verdict. This was a series where these two characters look at unsolved mysteries/cases and try to come to a verdict themselves. Among the cases they look at are Lizzie Borden and Who Burned the Reichstag. They first did this type of program in 1973 with a look at the case of Jack the Ripper. During all of this Z Cars was still on the air. Z Cars ended in 1978 after 800 episodes made and although the characters of Barlow and Watt never appeared together on TV again after Second Verdict, Windsor reprised his role of Watt in the final episode of Z Cars, Pressure. Sadly with this year being the 50th anniversary of Z Cars, it would have been nice if these programs officially saw the light of day. Like I mentioned, a lot of people may have never seen these programs but if you are into British television, you probably have heard of them. Programs like Z Cars & Softly, Softly are important to the history of British television. I understand how releases of hundreds of episodes is daunting but I think if a sample set is released of not just Z Cars but maybe a Barlow/Watt set including episodes from all of the different series they appeared in would not go amiss and probably wouldn’t sell as horrible as some people may think. These are good programs and they should be seen by everyone. Next week: This is where I deliver the goods. This article really did not have anything to do with final episodes but next week will. I will be writing about a theme night where I watched the final episodes of Black Adder Goes Forth, Man About the House, The Good Life, Only Fools and Horses, Upstairs Downstairs, Yes Minister, and Blake’s 7. I will explain why I think all of these episodes are great final episodes and why, in some cases, some people never learn when to keep a final episode final! Do you have feedback, article requests or want to talk about a program but do not want to leave a public comment? Feel free to drop me an e-mail at FTA13867@gmail.com I am on Twitter: @FromtheArchive I still have 1 follower! Great post! Coincidentally I've just been getting into Z Cars for the first time. It got me wondering why there's no DVDs of what's left of the show (like the DW Lost in Time type sets). I asked around in forums and no one knew so I contacted BBCWorldwide. Their response was that they doubt there'd be a strong market for it. BUT they also said that every quarter they go through their email and consider the volume of requests. So I think the only way to see it come out is to have people write in. Thank you for the comment. Also, thank you for letting us know the response from BBC Worldwide. I know I will be using that DVD e-mail address and bug them about these series! Hi Greg, I've been spreading this message around. You might've seen it at Gallifrey Base recently. I'm surprised at how few people have said they would indeed contact the BBC to let them know there is still an audience for it. But prefer to just complain that the Beeb isn't doing anything with it. If there is an interested audience, but do not feel inclined to show that interest in a proactive way (emailing BBC to let them know), I'm not sure what hope there is. A bit frustrating dealing with human nature! That's a shame that no one wants to bother them. I sent my e-mail in. Maybe I should do an article at some point about programs we want to see on DVD and how can we make it happen!